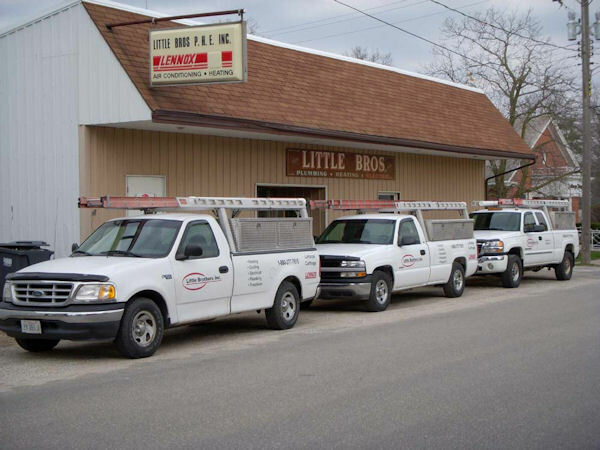 On September 18th, Eric Little closed the doors to Little Brothers Inc., Plumbing, Heating & Electric in La Harpe & Carthage after owning the company for 13 years of it's 64 year history. His thirteenth year of ownership did not bring him bad luck. Rather, Eric said it was his best year ever, but required a lot of family sacrifice that brought him to the decision to close. The Little's decision was a combination of Eric's desire to spend more time with family and community involvement and Jenni's new job as Marketing Officer at First State Bank of Illinois in La Harpe. "It was not about finances, but about family. Running a business, especially offering 24-hour service, was taking precious time away from family, the family farm, and many other interests," Jenni said. "There is a lot to be said for going out at the top of your game." said Eric. "A small business is very rewarding, but it is also very demanding." The Littles have appreciated the support from local folks. "We have many customers who have counted on us since the first generation of Little Brothers. Several have told us they are really going to miss us, and there are other small business owners who say they really understand the commitment, and the time it takes." "The hardest part is the people - both the employees and the customers. We are pursuing options to provide a smooth transition of service for our customers, and jobs for our employees. "We do greatly appreciate all our customers, and community support. I think it is a good time to mention how important it is for each of us to support our hometown businesses and to understand the commitment they are making to the community to offer their services." The Littles have a young family, two sons age 7 and 2, who are headed into many activities too good to miss out on. Eric looks forward to being available for such things as Lions Club meetings which he has missed in the past due to his job. They are also active members of the La Harpe Christian Church. Little Brothers was started in La Harpe by Robert and Stanley Little in 1945. Lldon Little joined his brothers not long after. These three of the eight children of Guy and Mary Little, started out in hardware and plumbing when hardware was in shortage due to the War and indoor plumbing was still new to the area. After Robert and Stanley's retirement in the early 80s, Lldon ran the business for many years and opened a second office in Carthage in 1990. Lldon retired and sold to his son, Eric, in 1996. Lldon's older son David, who began working at Little Brothers full time in the early 80s, continued working for Eric until the noon closing on Saturday, September 18, 2009. Pat Berlet served as office manager for 26 years. La Harpe has been blessed with 64 years of service from the Little families and we wish them the best in their new endeavors and thank them for their many years of commitment to La Harpe and surrounding area.